There are a lot of things I’m picky about; a good fried egg, the perfect red lipstick, the fabric, cut, and design of a dress (it is a huge pet peeve of mine when patterns don’t match up), but shoes are damn near the top of my list of the things I demand quality and excellent presentation on. As Cinderella taught many of us; a good shoe can change your life. 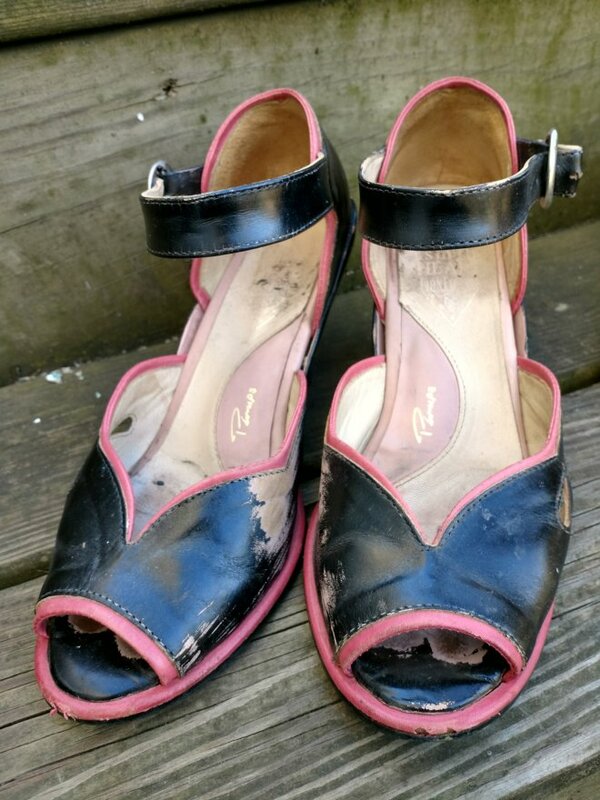 There are a few pinup-related brands out there and few reviews on them, so I thought I would take the time to share my thoughts on a few brands of shoes that I regularly wear and advise what is worth the coin and what isn’t. Chelsea Crew is one of my ride-or-die brands and I love them. They’re work horses, I’ve had a pair last me for a good four years with regular wear and tear, and I always get a ton of compliments whenever I wear something from them. While they can be dressier, they’re never uncomfortable. I’ve worn a few pair while trekking around New York City for miles and never once got a blister, and that alone gets brownie points in my book. Their heels are often sensible and while it’s a reproduction brand, they make sizing that is sensible and comfortable. 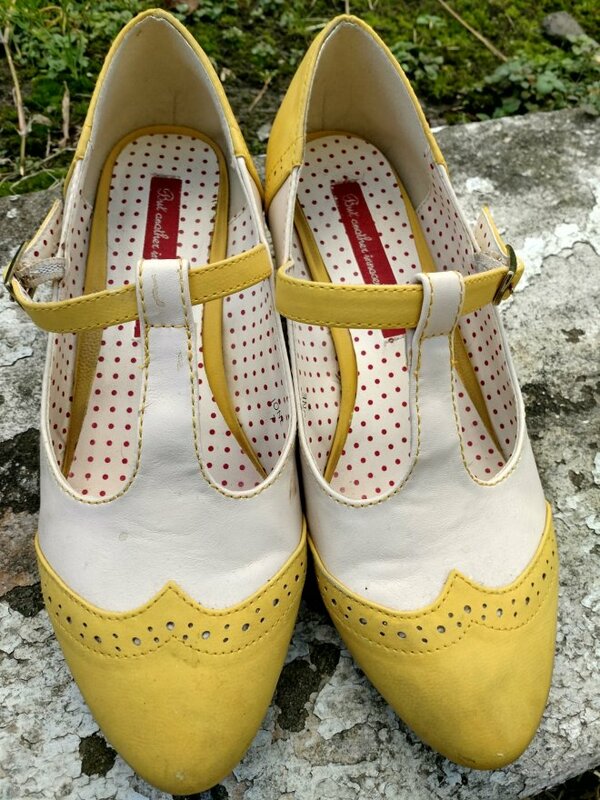 While I’m all for vintage styles, vintage sizing is something I can’t necessarily get behind (mostly because while I have size 7 feet, they are slightly wider than average. This brand makes it slightly wider, which is awesome because I don’t have to sit there from the get go and wonder if my feet will fit. Chelsea Crew is a company that was created in the USA, but is fairly secretive about their production practices. I have not been able to determine where their products are created and an email sent to their customer service has not yielded a response. If this sort of thing is of top concern to you, it may be something to consider before making a purchase. Speaking of this; Chelsea Crew does not sell directly from their website, but can be obtained from wholesalers such as Shoegasm, Royal Vintage Shoes, and a few other sellers. I think very highly of them and think they balance out cost (generally around ~$50-60) with quality, and would definitely purchase from them again if I found something for my collection. This being said, my friend was not lying. These shoes are some of the most comfortable ones I’ve tried and whenever I wear them, I’m guaranteed at least a compliment or two. 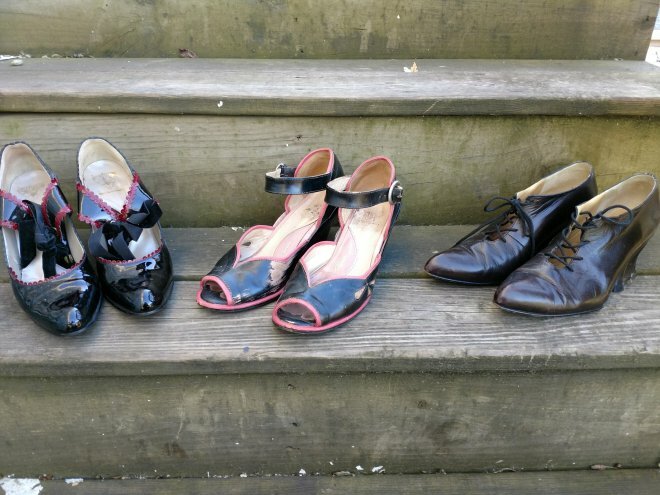 Of the shoes above, the ones I wear most are the pinup shoes (center of the picture). 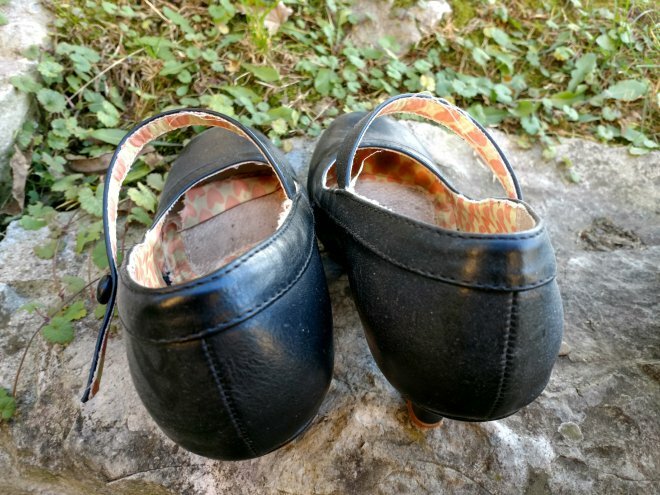 They’re wedged shoes, but I can wear them for hours and have walked miles in them without issue. 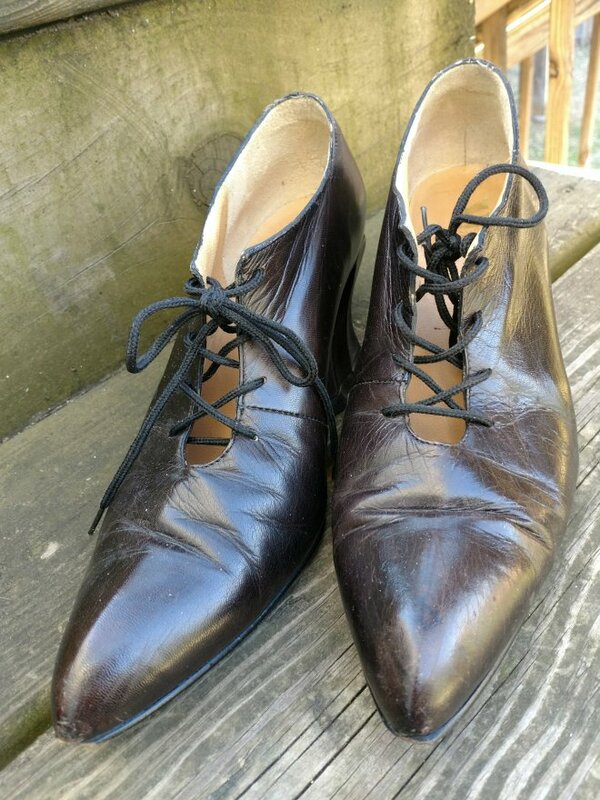 One thing I would recommend (and how I got my pairs) is looking for second-hand Fluevogs. They still have absurdly high resale values, but they aren’t going to hurt your wallet as a new pair might. Plus, buying second-hand items is just a good environmental practice, so it’s a win-win. 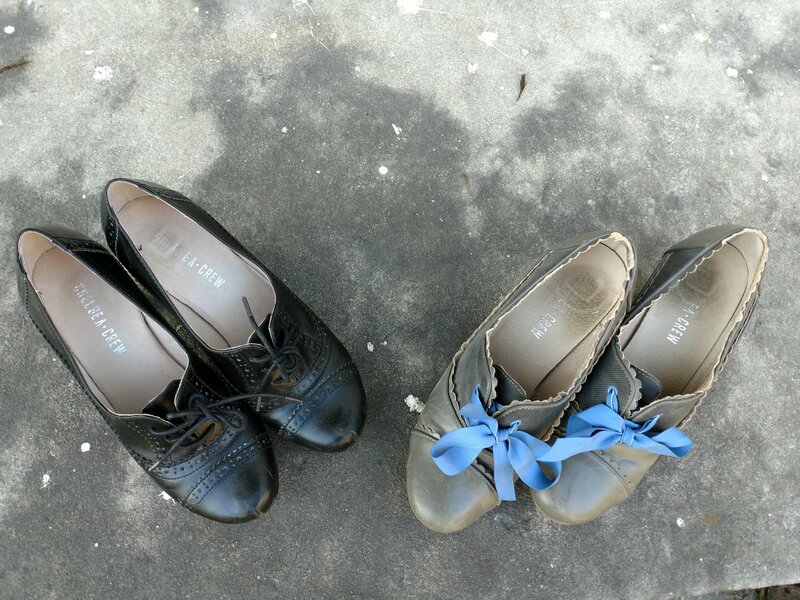 As you can see from the picture above, the second-hand ones I bought could really use a new paint job, which is something I will be investing in to keep them looking good and wearable with future outfits. While we have had success producing Vegan Vogs in the past, recent collections have been without vegan options as we continue to research different production methods and materials. We are currently in search of a leather substitute that is both sustainable and affordable, without compromising the quality that we’ve come to be known for. We have faith that Vegan Vogs will return and when they do, we intend to be shouting it from the rooftops (as well as on Facebook, Twitter, and Instagram)! 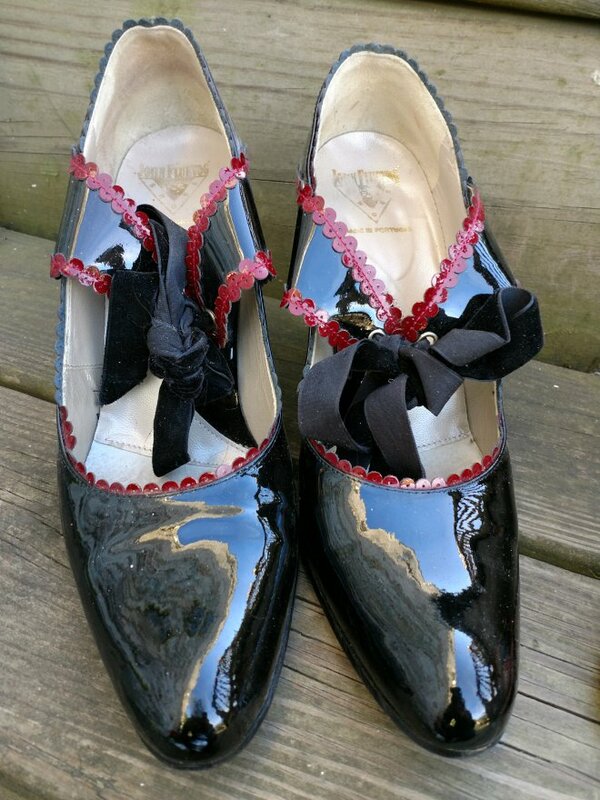 Fluevogs can also be really eccentric in design, which is fine if that is what you are into, but for true vintage or vintage-inspired design, they aren’t my go-to brand. Still, they are ones I would highly recommend. Though, I would recommend them second-hand if possible. I’d repurchase, but again: not where I’d start, especially when I’ve had good luck with cheaper brands. Bettie Page Shoes are a brand named after the infamous pinup, Bettie Page. They are a vintage reproduction brand that is lower-to-mid (depending on your budget) priced and can be found pretty easily on the internet, specifically on Amazon (which is where I found my two). Look, I made it clear that when I started blogging that I would be honest. And in all honesty: I’m really, really disappointed I had spent an Amazon giftcard or two on these. The exterior part of the shoes are nice enough and resistant to scuffing, but the insides are a mess. The soles detached from the shoes and this occurred within the first week of wear. Because of this, there’s no way I would recommend these for daily use. On the left pair, you can see where the sole is detaching from the shoe and remains curled up. 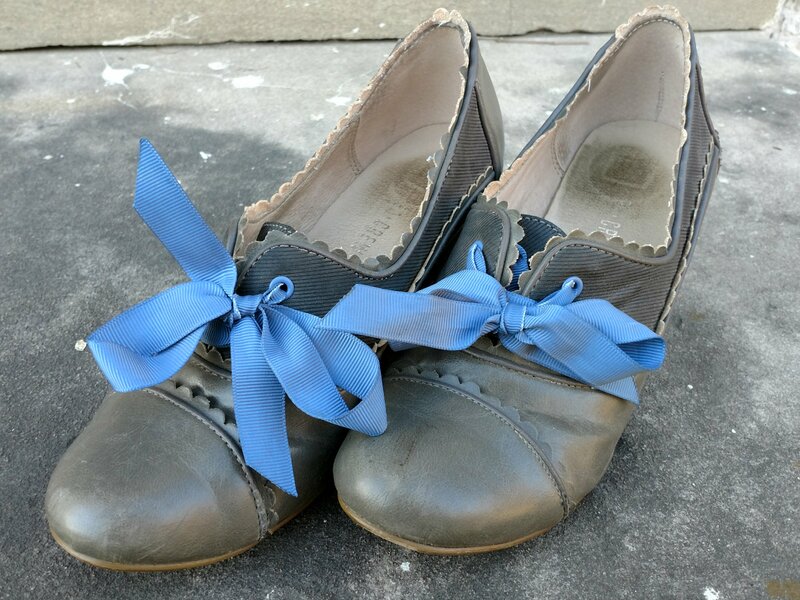 I don’t wear the blue pair that often (and did wear it during the 50’s Cinderella-inspired photoshoot), but it’s OK to wear for a decent amount of time and can walk in them comfortably. Given this experience, I wouldn’t recommend them (and definitely will not be repurchasing) unless you need something delivered within 2 business days and it’s not something you’ll be wearing for daily use, unless you’re willing to replace the soles. B.A.I.T. Footwear is one of those ubiquitous pinup brands that if you are on social media, you have probably seen worn by the big name pinups. (Cue the “If you’re a pinup on social media, are you really a pinup on social media if you haven’t posted a picture of yourself in B.A.I.T. Footwear on Instagram?” gag.) A friend of mine, 8-Bit Pinup, is also a pretty big fan of their shoes. B.A.I.T. is an acronym for “But Another Innocent Tale” and they are a very vocal company for non-human animal rights and often have donations for local humane shelters. The matte shades are less scuff-resistant, but they are comfortable to wear over several hours. I’ve worn them with stockings and without and didn’t have any issues with chafing or blisters. This being said, I also break in my shoes by mushing them a bit and wearing them with thick socks/stockings around the house until they “feel” right. As Jessi points out rightly, one of the things about vegan leather is that it requires a little extra breaking in. They have a pretty significant variety of shoe types available (heels, boots, wedges, etc.) and in a huge variety of colors which appeals to me immensely. 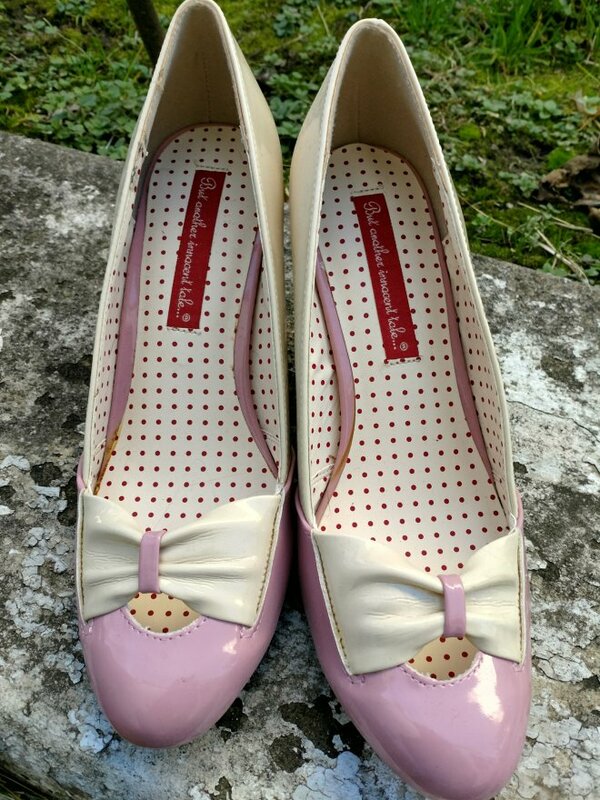 It is strictly a vintage reproduction brand based on actual shoes from the 1920’s-1960’s, and it is reflected in a lot of their products. B.A.I.T. is also a vegan brand, which is great for those that are looking for a vegan option among this list. B.A.I.T. is one of my favorites (and I’m so, so sorry for being hesitant!) and I’m glad I gave them a shot and have repurchased. Of the brands listed in this post, the ones I would strongly recommend without hesitation (assuming they fit your ethics and budget) are Chelsea Crew and B.A.I.T. Footwear. 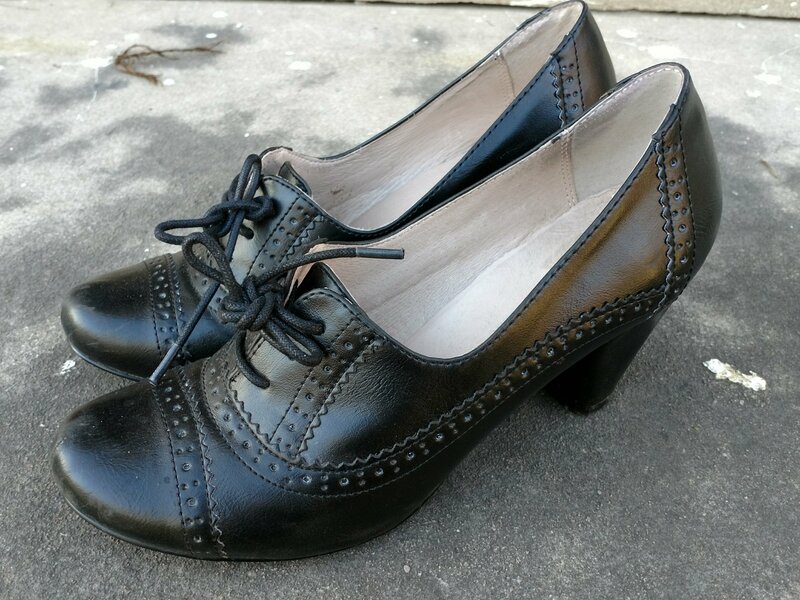 I would recommend Fluevogs as well, but only if it fits your budget (seriously, there are just as good options out there at better price points) or you can find good second-hand ones. Let me know if I am missing out on any of your favorite brands or if there’s any you would like to try!